Powerful, easy to use drawing application. Is there a better alternative to WouldjaDraw? Is WouldjaDraw really the best app in Illustration category? Will WouldjaDraw work good on macOS 10.13.4? Adds 64 bit support for Mac OS X 10.6 Snow Leopard. Powerful Drawing Tools: WouldjaDraw's easy-to-use tools let you draw anything you can imagine. WouldjaDraw even provides a Bezier curve tool, a feature usually only found in more expensive drawing packages. Flexible Inspector Palettes: WouldjaDraw's Inspector palettes let you edit all the properties of your document. By dragging the palette tabs, you can arrange the Inspector to work the way you want. Unique Gradient Tools: WouldjaDraw provides the ability to fill any shape with a gradient. And with WouldjaDraw's unique gradient handle controls, you can position the gradient right on the page. Standard Export Formats: Like any good drawing program, WouldjaDraw allows you to export to a number of standard formats, including PDF, PNG, TIFF, JPEG and GIF. You can also easily copy and paste your drawing into other applications that support the PDF format. 64-bit support: Get even more speed out of your Intel-based Mac with 64 bit support. (Requires Intel processor, Mac OS X 10.5 or later). Improved Text Editing: Apply font and style changes to multiple selected text blocks, including text contained inside a group. You can even edit text inside a group! 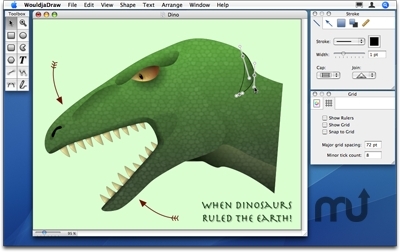 Cover Flow: WouldjaDraw drawings show a thumbnail of the drawing when viewing a folder in Cover Flow view in the Finder. (Requires Mac OS X 10.5 or later). Free Rotate: Rotate shapes quickly and easily right on the page! Quick Look: See Quick Look views of WouldjaDraw drawings. Just click on the file icon and tap the space bar. (Requires Mac OS X 10.5 or later). Arrows: Choose from a number of arrow styles and sizes!